There are more than 100 recognized styles of beer being made today. For the most part I'm happy to ignore all of them and just brew what I want. I think ingredient combinations and techniques should be based on hitting the flavors and characteristics you like, not some mostly arbitrary target that someone else (BJCP, World Beer Cup, Brewers Association etc...) came up with. So it is with great sadness that admit that I recently brewed one of my favorite beers, a completely by the numbers, no-nonsense German Hefe Weisse. The recipe I used for this batch was very close to another one I brewed in the fall of 2008 that was just about perfect, banana (but not too much), bread, clove, light, spritzy, and delicious (I did up the alcohol a bit this time to 5% ABV). I tried to brew a batch with extract last fall, but the bready malt depth and balance just weren't there. 1. Mashed in at 114 F for ferulic acid (a precursor for the molecule that gives the spicy clove character) using 2 qrts of water per pound of grain. 2. After 15 minutes I turned on the burner and brought the mash up to 125 F for a protein rest, stirring regularly to prevent the grain at the bottom from scorching. 3. 10 minutes later I turned the heat back on and took the mash up to 144 F to start the conversion of starches into sugar. 4. 10 minutes into the Saccharification rest I pulled about 1/3 of the mash (thicker than the mash, but still with plenty of liquid on the advice of Kai's excellent decoction guide on German brewing and more) and heated it to a boil over 30 minutes. 5.After boiling the decoction for 10 minute I added the decoction back to the main mash for a second, warmer, Saccharification rest at 161 F to finish off conversion. I let the mash rest here for 20 minutes before proceeding with the brew. I added the mash along with all the 180 degree sparge water to my mash tun, stirred, recirculated and ran off the wort. Once I collected enough wort I boiled it with a single addition of really low alpha acid Spalt hops at 75 minutes for bittering. The ground water at my house is around 82 F this time of year, so after getting the wort under 90 F I moved it to my fermentation fridge to cool to pitching temps. I had great luck pitching and fermenting Wyeast 3068 at 55 F ambient last time, so I did the same this time. After 4 days I increased the ambient temp to 62 to make sure the yeast doesn't stall out as fermentation nears completion. After two weeks, assuming fermentation is finished, I'll drop the temperature close to 32 F for 7-10 days of cold conditioning before bottling the beer. 2.00 oz. Spalter Spalt (Pellet, 1.50% AA) @ 75 min. 0.40 Tsp Yeast Nutrient 10 min. Made a 1 qrt starter the night before to split between this one and the other wheat beer I am brewing. Mashed 18 lbs of malt, 50% each Weyermann Wheat and French Pils. Added all the sparge water before running off the mash, stirred and waited a few minutes then ran off 8 gallons @ 1.040 for this beer. Took 1 gallon of the runnings to add to the other half of the batch, added 1 gallon of boiling water to this to replace the volume. The other half of the wort went to the Hoppy Hefe. 8 month old hops adjusted down from 2% AA. Chilled to ~85, racked to a bucket, moved to fridge set to 55. Added 1 cup of wort to the starter and put it in the fridge so it would be active and the same temp at pitching. 6hours later I pitched 3 cups of the starter and gave 45 seconds of pure oxygen, returned to the fridge @ 55 degrees. Good fermentation after 18 hours, small amount of blow off. 7/22/10 Upped temp to 62 to help fermentation finish out. 7/26/10 Upped to 65 as the beer still has a big krausen on it. 8/1/10 Racked to keg. Dropped temp to 34 to drop excess yeast/protein out of solution. 8/12/10 Bottled with 5 oz of cane sugar in 1 pint of water, aiming for ~3.5 volumes of CO2. 9/16/10 Turned out really well, good balance of fruit/spice/dough. Not much I would change next time around, but the head retention was mediocre. looks good. i don't have fermentation fridges so i have to wait til mid-late fall to do hefeweizen. i'm sure you know, but a protein rest is pretty unnecessary. few protease enzymes make it through malting these days. i like the decoction though. makes run-off a breeze with high percentages of wheat. I've heard that as well, but I don't remember ever reading it from a reputable source (got one?). Listing the steps to get a cloudy German Wheat beer, Brewing With Wheat says "Keys are a protein rest at 122 F (50 C) during mashing..."
Hefeweizen seems to stick out to me as a beer that is much loved among my friends that really enjoy beer but aren't geeky about it. Therefore, I think its important to get it right. Though I also think there is a good bit to play around. You can vary yeast to get more spicy or more banana. You can use the basic 50/50 wheat/pils or add some darker malt to get something like Schneider, or even a dunkel-weisse. I like, and see nothing wrong with, a small late addition of Hallertau hops (or similar) for a subtle hop flavor. i can't recall the source but it might be Michael Lewis. the thing about cloudy hefe, i thought, was the it was roused yeast and didn't really have anything to do with protein haze. had a significant amount of protease survive malting, a protein mash rest would break them down and a decoction would coagulate proteins thus making them susceptible to being filtered out by the grain bed. You are completely right that the yeast provides most of the cloudiness. That said, according to Brewing With Wheat many big breweries (and some small ones) are now adding products that provide a permanent haze with names like Biocloud (yeast derived) and Tanal-A (gallnuts). That said even after the yeast settles out my hefes retain some haze. The theory is that long chain proteins are more likely to clump and drop out of solution while shorter proteins will stay in solution longer. Sounds great, but I have a couple of questions... why a 75 minute boil? Wouldn't 60 be enough? Also, doesn't your pot on the stove lose heat really quickly, or do you keep the burner on and stir during the mashing? Finally, why the cold conditioning... are you trying to settle out more of the solids? As always, thanks for the great beer blog! It was actually a 115 min boil, with the hops were added at 75. A longer boil (90+ min) is traditional when using pils malt because it is kilned as at a lower temperature than pale malt and still has a good deal of the precursor to DMS. I like boiling for 10-15 minutes before adding hops to give the protein a chance to coagulate onto itself and not the hops. Not a big deal, but it is something that works for me. With all of that mass (10 gallon mash) I didn’t lose temp too fast. Although during the first Sacch rest I did turn on the heat and stir to boost the temp back up after it lost 2 degrees over the first 20 minutes. If you were doing a smaller batch, temp loss would certainly be more of a concern. I usually mash in a cooler to avoid this issue, but in this case being able to direct heat was worth the extra effort. I’ve found that most of my beers benefit from a period of cold conditioning after fermentation (it is something that nearly every craft brewery does). It helps to settle out yeast and protein so the beer is ready to drink sooner and also stays fresher longer. Although with a beer like this a bit of yeast/protein isn’t a bad thing, thus the short period of cold stabilization. A period of lagering is actually a traditional part of the production of the style in Germany according to Eric Warner’s book German Wheat Beer. I actually just brewed this yesterday. Did the same mash schedule, though, as the last time I tried to do a decoction, it failed to raise the mash to the proper temp so I had to apply direct heat. Not sure what it is I'm doing wrong..
You probably aren't pulling a big enough decoction, that is what happened to me the first few times I tried to decoct a beer. 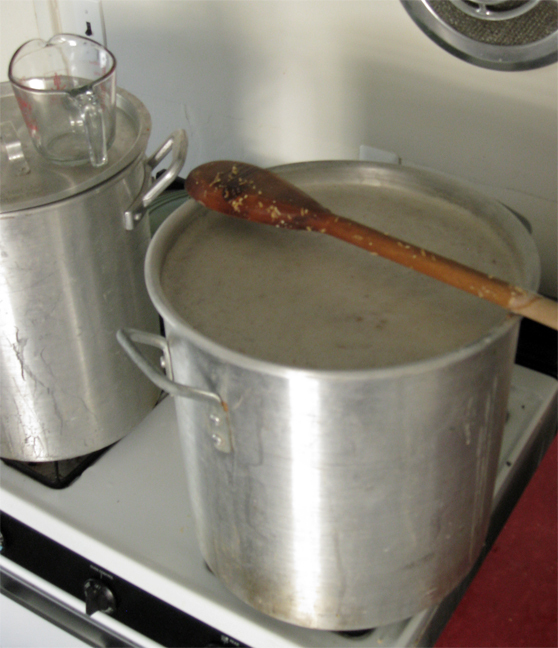 Calculators tend to assume that you don't lose any volume to evaporation, and your main mash won't lose heat. Next time pull some extra (I set the Promash mash calculator to have the returned decoction be 200 F), but don't add it all back at once, add it slowly a stirring until you hit the right temp. Hope it turns out well, good luck. Thanks, I'll try that. How did the hefeweizen turn out? Hoping to have time to bottle this one tonight, but the sample I pulled last week was excellent (moderate banana, bready, bit of spice etc…). Well, my hefeweizen has been in primary for 10 days and it still has a krausen and bubbles a few times a minute. I fermented it at 62°F for the first few days, and let it rise to 65°F over the last 4 or so. Wonder if WLP300 is just a slow-working yeast. Was the white wheat malted? You’d need the enzymes in malted wheat for such a high percentage. I ask because it doesn’t sounds like you got great conversion with such low attenuation. BIAB can require longer rests as well because the enzymes are diluted more. It does sounds like you have an infection (bubbly film doesn’t sound like brewer’s yeast), has the gravity fallen any more in secondary? How long had it been since you had used/washed the yeast? Any other details you can think of? yeah, malted wheat and pils should make a fine beer. The only issue with such a large amount of wheat is lautering (and with BIAB that isn't a problem). I'm always too worried about sanitation and yeast health to save yeast for that long. Plenty of people do it with good results, but with the time/effort I put into a beer I feel better repitching immediately. How do you go about adding everything to the mash tun to lauter? Do you just dump everything in? I put most of the water in first, then slowly stir in the crushed grain. 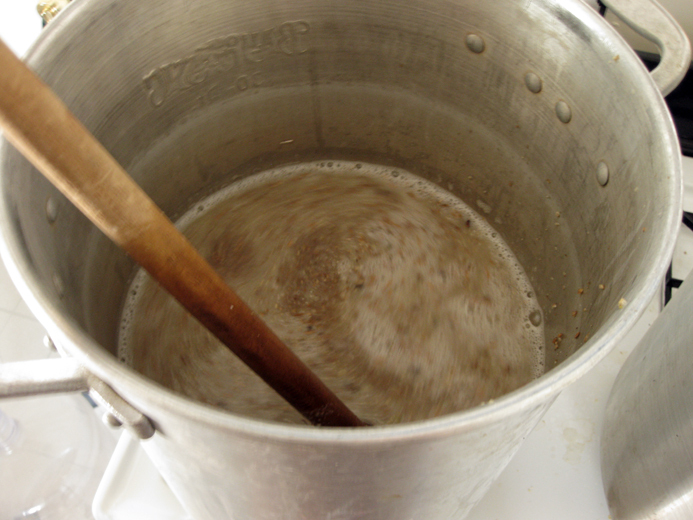 You want to stir to prevent the grain from clumping. Once all of the grain is in I take a temperature, then keep adding hot water until the desired temperature is reached. Works for my system. How do you avoid extracting tannins when boiling the grist? You don't have to do anything special to reduce tannin extraction during a decoction. Tannin extraction is an issue during the sparge because the pH rises as the buffering power of the malt is depleted. That isn't an issue here.